Congratulations to Gretchen Oschman on winning our 158th High Five Giveaway and thank you to all who entered! 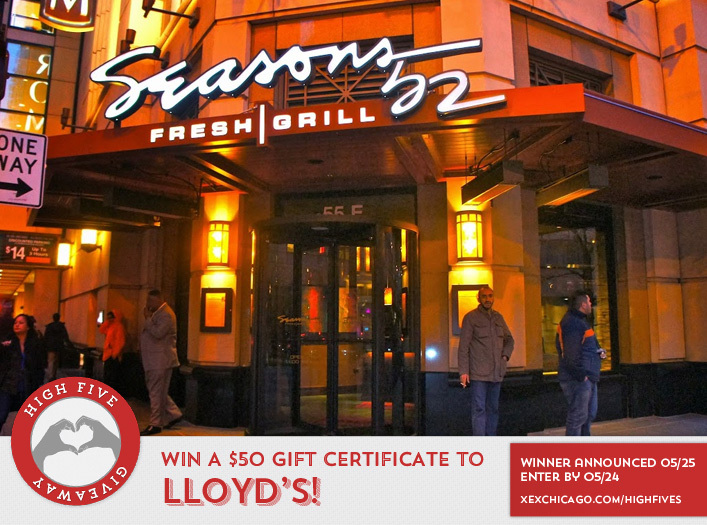 Our next High Five Giveaway is for a $52 gift certificate to Seasons 52. Please note: Seasons 52’s Chicago location has recently closed. Your gift certificate will be good at their Oak Brook location at 3 Oakbrook Center, Oak Brook, IL. Their phone number is (630) 571-4752. Visit their website at www.seasons52.com. What kind of brush is it good to invest in if you have hair extensions? Now, just add a comment to this post with the right answer to be eligible to win! The winner will be announced on Wednesday, May 25. Entries must be received by midnight on Tuesday, May 24. Seasons 52 on Grand is permanently closed since last month. I work next door. Thanks Jessica! We are updating the post now. The gift certificate will be good at their Oak Brook location!